So, you have decided to take on saltwater fishing. If you are coming from freshwater fishing, you might have learnt that there are a few different techniques when it comes to saltwater fishing. Now, you want the best saltwater fishing boat, so that you can fully experience the thrill of fishing. Saltwater fishing boats are designed and built differently than other boats. This means that buying one requires taking some decisions. [i]There is no worse way to end your fishing trip than running out of space in the fish box, therefore, a well-designed, large enough fish box is a necessity. To choose one that drains overboard would be ideal, as those with a pump tend to easily get clogged by scales, slime and so on, which would, at best become a nuisance (or rather expensive)! Lugging around tons of equipment? No thanks! If you do not mind carrying all of your fishing equipment back home after every fishing trip, a lockable stowage compartment is also a must! Find a boat which has a compartment large enough to be able to store reels, rods, tackle boxes and other equipment. Making sure that the compartment is adequately insulated is also a plus, since this would prevent your equipment from getting weathered. The larger the fuel capacity, the better. What is worse than wanting to go those few extra miles further and realising that you might not make it home if you do so? You might be thinking that you will not be using your boat for long trips. Trust me, you will. The temptation will arise no matter what. 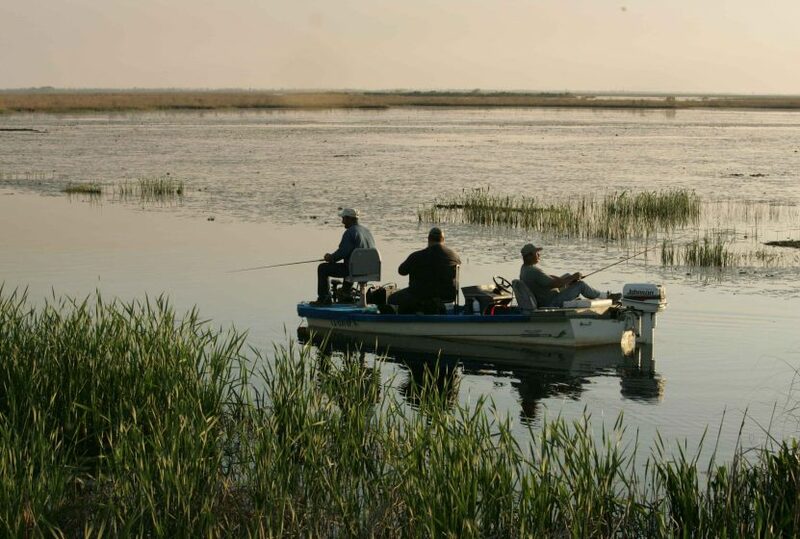 What kind of fishing trips will you be embarking on? If you fancy a bit of speed at the expense of fuel economy, you might want to go for a larger, more powerful motor, or a boat with more than one motor. A more powerful motor will be able to withstand more abuse. If, however, you don’t want to go big, and your boat is quite light, you might do well with a smaller, less powerful motor, which would return greater fuel economy. Remember that you will be pushing your boat further than those who only do freshwater fishing. This means that you need to choose a boat that has a powerful motor and good stability. This puts your mind at ease that your craft will be able to withstand the abuse. You might get a good deal on a used boat. However, you might want to get a marine surveyor to check and make sure that the boat is in good working order and that it is safe to use. Since used boats might have run out of their manufacturer’s warranty. If your budget permits, go for a new boat. A new boat will provide you with trouble free operation which is guaranteed by the manufacturer’s warranty. A decent water wash-down system is a requirement. If you allow the blood and bits of fish to dry up in the sunlight, your boat will end up looking and smelling horrible. So, it is important to choose a system that has enough pressure to be able to wash away any unwanted bits off. This allows you to keep your pride and joy looking clean and inviting. Due to the nature of salt water, rod holders must be of stainless steel or aluminium, otherwise they will erode. Also, they need to be able to be locked into position. Be sure to check thoroughly all fittings and parts of the boat to ensure that stainless steel is of 316 grade or better. Any lower grade stainless steel, steel, or plastic fittings will rust or bubble up after a few trips. This will make your craft look horrible, or worse, turn it into a safety hazard. You also need to take the size of your prospective purchase into consideration. How large do you want your boat to be? How many people are you planning to take with you? The type of hull your boat has dictates speed, fuel economy, and stability, among others. This means that you need to choose a boat which has a hull that would suit your needs. Meanwhile, if you prefer stability and better handling, you should go for the traditional V shaped hull, which offers both at the expense of higher fuel consumption. You have to weigh the advantages and disadvantages of each to choose which one suits your needs best. Nevertheless, you should make sure that whichever your choice of the best saltwater fishing boat is, you do not exceed your budget. Running costs and maintenance can easily add up, and if you are not prepared to pay up, you could easily end up with a disused shell, which is a complete waste of time and money. It is far better to scale down a bit and choose something smaller that you can afford rather than going big and buying something you can’t run. The video explains in detail what you need to look for when purchasing your boat. Several boats are presented and are walked through individually, tailoring to their owner’s needs, since it is really up to you what you do with your own boat. Your boat needs to be tailored to your preferences.